Fresh into the second quarter of 2010, we were faced with news about the change in the Ning business model. It hasn’t been even a year since this news… yet I felt compelled to write about the way Ning looks moving forward. There are several reasons why companies don’t do this: It might reveal too much to the competition. It might force commitments and limit flexibility. It may feel like a burden. Plus, don’t customers like to be surprised when they sign in and spot a shiny, new feature? Under-promise and over-deliver, right? There are several ways to look at it. But there’s one extremely good reason a company like ours should publish a product roadmap: Quite simply, it will make our customers happy. Making customers happy is a core part of our business. Know what? I loved that they did it! It helps US (network creators) plan for the future, knowing what will and won’t be available and when (at least in the coming six months). As for competitors, they seem to be moving forward not minding as much that competitors may know what will they be doing or when. As long as Ning delivers on their promise (roll out functional features according to their product map), the moment features become announced on the Product Map, they are being put in the open, so… I don’t think they are losing that much competitive edge by opening up their six-month product map to the world. Another thing they are doing very well is to help people develop the best networks they possibly can, through an assortment of Best Practices and a Getting Started guide combined with Troubleshooting Guides and a public Known Issues page. All these elements speak to me of transparency and, combined with the features one can learn about through the roadmap, also tell me of evolution! 2011 promises to be a very exciting year for anyone using Ning or considering to do so. Do you have any thoughts or comments on Ning in 2011 and beyond? More than a year later (now it’s called DFP Small Business, but it is essentially the same service), we continue to be very happy with the platform. It lets you manage multiple orders for multiple clients over multiple inventory locations. This is ideal for us, having two networks to manage ads on and typically having multiple campaigns under way. Shortly after I wrote 5 ways to follow 5,000 people on Twitter last year, it dawned on me that I was resorting to all sorts of tools and hacks to “follow” people, when I didn’t really need to follow them. Here are some of the lessons I have learned as I have gone on a pruning spree, from “following” nearly 5,000 people on Twitter to just over 400 people in a little over 6 months. You can start pruning by removing people who no longer use Twitter. They are not really the ones adding more noise to your Twitter feed (after all, they are no longer updating), but it will give you a sense of accomplishment. You can use a tool called Your Tweeter Karma for this. You will soon find that there’s only so many people you can unfollow because they are no longer using Twitter. Where to go next? You could argue that the Mashable’s and the RWW’s of Twitter are must-follows and that is true to a certain extent. After all, they are valuable sources of information for people on social media (about social media?) But over time, they have become such “celebrities” in their own right that tons of people retweet their content. So, do you really need to follow them? I argue that, if you follow the “right” people, you don’t need to follow these accounts too. Who are the right people? For me, examples of this are folks like @heykim, @svartling, @johnhaydon and @JoyceSchneider1. They are content hoses, but they do an amazing job at curating high quality tweets. I also have found that unfollowing people who tweet their Foursquare location a little too often comes in handy. I hope I am not alienating too many people by my iTunes “likes” which I tweet once in a while. I am not a big fan of drama: and guess what! Drama takes up some important real estate on Twitter when it breaks out. So, when I see drama unfold in front of me (I mean drama as in personal exchanges with insults flying back and forth, between two people on Twitter; not drama as in the madness going on in Egypt), I typically unfollow both persons. I really hope these folks resolve their personal disagreement… just not in front of all of us. If I can be of assistance, perhaps they will message me in some other way. You don’t need to follow EVERY news outlet out there. Specially, if you don’t do the same in real life. After all, there’s only SO many news to break and, except for niche media or SERIOUS news organizations, they all cover the same news. So, that is to say: follow the news accounts you really care about. Just because you can easily follow all of them, doesn’t mean it’s a good idea. Also note most news outlets now have multiple Twitter accounts, so you may be able to really narrow down what aspect (section) of their coverage you want to see take up space on your Twitter feed. If you love a particular product/service that has a presence on Twitter and they use their Twitter feed just to push content (“me” talk), without interacting with others, don’t follow them! If you already do, unfollow them: they obviously don’t care about you that much, so why should you care about them? You can express your love for the product by continuing to buy it and, if you REALLY are into it, you can let them know through Twitter or contacting them via email that their use of Social Media is not really being that social. On a similar note than “me” talk-only products/services fall the vast majority of celebrity Twitter accounts. One exception that I love is @Alyssa_Milano (and I am sure there’s a few more!) She not only follows other people: she replies and RT’s other’s content that she cares about. Remember there is a place for lists. You don’t need to follow on Twitter every single person you meet. Perhaps someone is an expert on games or mobile technology and you may have a need to hear more conversations about that in the future. Add them to your “Games” or “Mobile” list and move on. If you manage multiple accounts, you don’t need to follow them all… not forever, at least. I have direct/indirect access to nearly 10 accounts. I follow only a few of them. Last, be brave! You may find that the number of people who follow you drops… As long as you have something useful to share (your own content or RT’ing other material) you will remain relevant in the eyes of some. And that is fine. And if you are no longer worthy of being followed, then so be it. 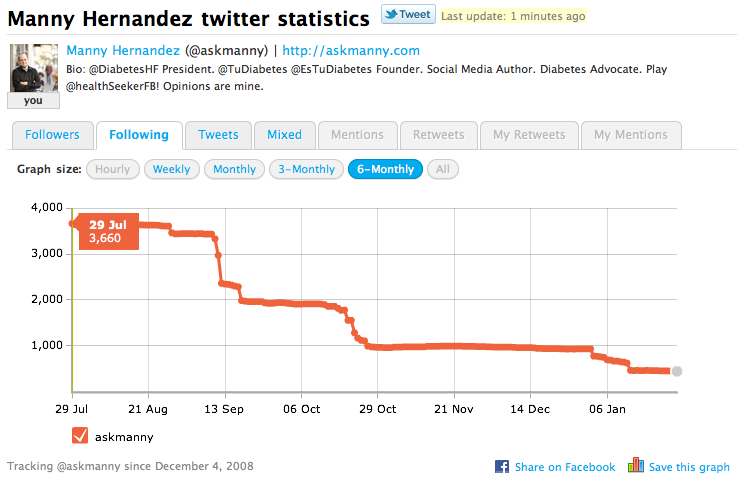 Twitter is not a popularity contest: to me, it’s become one of my top tools to stay plugged into the latest in news, diabetes, nonprofits and technology. And that means you need to do a whole lot of listening.